George Harvey Strait (born May 18, 1952) is an American country music singer, actor and music producer. 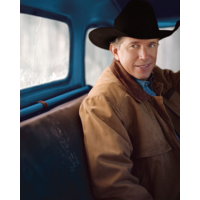 Strait is referred to as the "King of Country," and critics call Strait a living legend. He is known for his unique style of western swing music, bar-room ballads, honky-tonk style, and fresh yet traditional country western music. George Strait holds the world record for more #1 hit singles than any other artist in the history of music on any chart or in any genre. As of 2010 he has recorded 57 #1 hit singles. Strait rocketed to success after his first single "Unwound" gave him his first hit in 1981. While contributing to the neo-traditional movement of the 1980s, he amassed seven number one albums in the decade with his most popular hits including "Fool Hearted Memory" and "Ocean Front Property". By the 1990s, Strait had influenced a new breed of performers while continuing his own successes, having charted upwards of 20 number one hits including "Heartland" and "Blue Clear Sky". The next decade for which he was named Artist Of The Decade by the ACM, he was elected into the Country Music Hall of Fame and won his first Grammy award for his hit album Troubadour. Strait continued his previous successes during this time, producing a more contemporary sound with moderate cross-over hits including "She'll Leave You with a Smile" and "You'll Be There". Strait won CMA Entertainer of the year in 1989 and 1990 and ACM Entertainer of the year in 1990. He has been nominated for more CMA and ACM awards and has more wins in both categories than any other artist. As of 2009, he holds the record for the most Number One hits on the Billboard Hot Country Songs charts with 44 number one singles on that chart. Counting all other music charts, Strait has amassed a total of 57 number one hits overall, breaking a record previously set by Conway Twitty. Strait has sold more than 68.5 million albums in the United States and his certifications from the RIAA include 13 multi-platinum, 33 platinum and 38 gold albums. His best-selling album is Pure Country (1992), which sold 6 million (6× Multi-platinum). His highest certified album is Strait Out of the Box (1995), which sold 2 million copies (8× Multi-Platinum due to being a box set with four CDs). According to the RIAA, Strait is the 12th best-selling recording artist with the albums in the United States overall.